From Sony Classics comes another entry in the Herbert Von Karajan - His Legacy series. Each program presents viewers with one of the many performances by legendary conductor, Herbert Von Karajan, whose music career spanned more than fifty years. 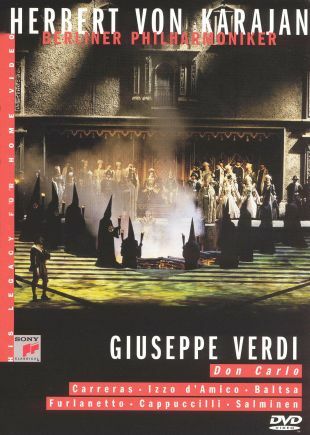 Featuring Ferruccio Furlanetto and Jose Carreras, Herbert Von Karajan - His Legacy for Home Video: Don Carlos presents a 1986 performance of Verdi's Don Carlos by Von Karajan and the Berlin Philharmonic Orchestra at the Salzburger Osterfestspiele.